I'm back from Arizona and I have almost 400 photos to sort through before I can make a blog post about the trip. I had a great time and added a number of lifer bird species. As exciting as this was, just my second day back in Minnesota and I pick up another lifer bird! 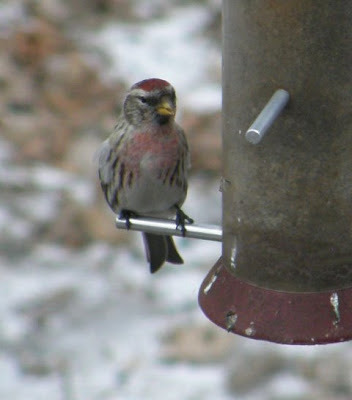 We've had a flock of Common Redpolls hanging out at the nature center for months now but we've kept an eye out for Hoary Redpolls mixed in. Sure enough, look who showed up this morning! So how do we know this is a Hoary Redpoll and not a Common Redpoll? There are a number of characteristics. First off, let's look at the poll. That's the red spot on the head. It is smaller than the red spot on a Common Redpoll. We can see some other features in the shot above as well. The flanks of the bird are only very lightly streaked. On a Common Redpoll the stripes would be darker and solid. The third characteristic to notice is that there is only a faint pinkish wash on the breast. The red on the breast of a male Common Redpoll is much much brighter. Compare all of these feature with this handsome male Common Redpoll. This is actually a light Common Redpoll, the red can be much brighter on the breast. Let's look at the next shot. In this one you can see the small beak. (compare with the chunkier bill in the previous shot) It is even smaller than the beak of a Common Redpoll. There is also less black on the face and the head is lighter overall. 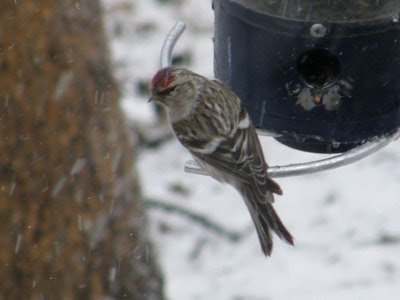 The scapulars on the back of the bird are also "frosty" or "hoary" and not as dark as on a Common Redpoll. 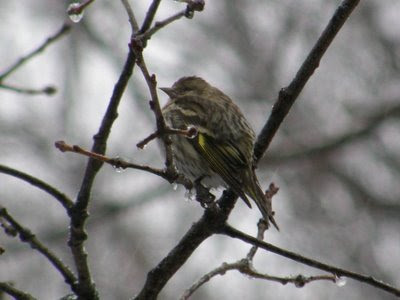 the last photo of the Hoary Redpoll is blurry but I'm including it as it shows a diagnostic characteristic of the bird. 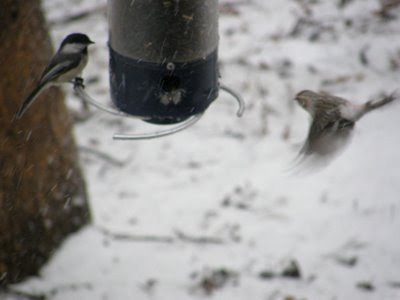 Look at the rump of the bird as it comes in to land at the feeder. It is all white. The rump of a Common Redpoll would be streaked consistent with the pattern on the back. It was fun to have a visitor from the arctic here on such a snowy day. I though I'd also throw in this photo of a Pine Sisken who showed up. You can tell it is cold out as he is really fluffed up! If you see a flock of redpolls feeding out in a fallow field, glass the perimeter of the flock. 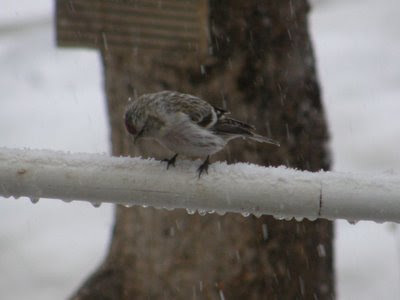 Hoary redpolls usually do not mingle in the primary flock and if present will likely be along the outside edge of the birds.